We are confident that the renovations of the Devonshire Park complex in Eastbourne will be completed to a point where we will be able to hold the Summer Meeting in the refurbished buildings. 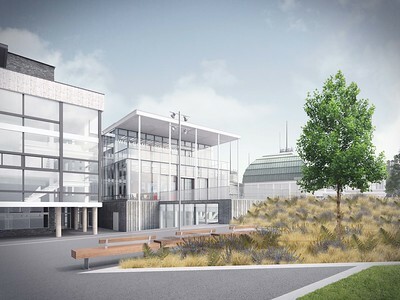 This follows a site visit, and conversations with those involved - and we're pleased to say the new venue looks excellent (picture shows an artist's impression of the finished venue). Some information on the renovations can be seen on the Conference Eastbourne website. There may, of course, be unforeseen circumstances outside our control which mean that this is not possible - so please keep this in mind when making any travel or accommodation reservations - however we are proceeding as though the event will be at this venue in 2019. Further details on the congress will be added here when finalised. Please find below for information on the venue, parking, and attractions to fill your weekend away from the table. A long weekend of bridge in the seaside resort of Eastbourne. The Saturday Swiss Pairs is open to all players eliminated from the Championship Pairs on Friday, as well as new entrants joining the event at this stage. The Edith Kaplan Trophy and the prize is awarded to the winners of the teams on Sunday. There will be a special category prize for the winners of the teams. Please note: The WBF - and consequently the EBL and Bridge Great Britain - have adjusted their criteria for eligibility for Seniors events. The EBU has therefore adjusted its criteria in response to this. Please note, therefore, that to be eligible players must have their 61st birthday or beyond during the calendar year (January-December) of the event - i.e. entrants must be born in 1958 or earlier. See here for further details. Entries for this event are not yet being taken. with a break after the third match. Closing date for entries is 1st July 2019. All events are fully Green Pointed, save for the Championship Pairs qualifying rounds (Blue Points only, but all qualifiers are guaranteed a green Point award). On street parking is available free of charge in nearby streets. A discounted rate is available at an NCP carpark ten minutes walk from the tennis centre - Trinity Trees NCP at the junction of Trinity Place and Compton Street. You can park here for £2.50 for 24 hours (price subject to change by the local council). Please note that the carpark closes at 9pm, so if you are not staying overnight you will need to move your car before the start of the evening session. On street parking is free in many places in the area around Devonshire Park after 6pm. For instructions on how to receive the discount on your parking rates, see here. The 'discount tickets' will be available via EBU staff at the congress. The tickets are valid for use throughout the congress, so we would recommend you collect a ticket on arrival at the venue, rather than when you are leaving, to avoid any delays should you need to leave unexpectedly. Charges apply 8am – 6pm every day. No charges apply when displaying a valid disabled badge.